When it comes to moving we usually imagine the stress of packing our entire home, the long journey and the time needed to accustom to our new abode. 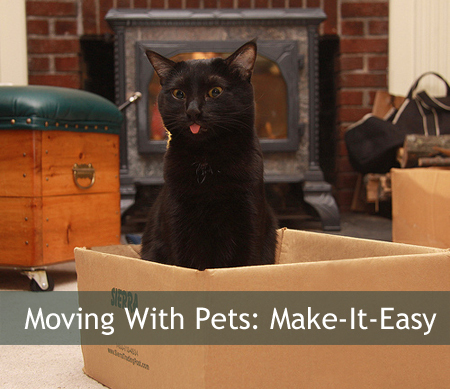 What we often forget is that moving is as stressful to our pets as well. Pets have strong instincts, love open spaces and spending long hours in small transportation crates can be really traumatic for them. Reading the below info and advices will let you make your moving with pets less stressful for you and your loved four-legged family members. Take your pet to the vets for checkup and vaccination if such is needed. If you travel abroad or the new home state has specific regulations make sure you obtain all the necessary documents and your pet’s health record from the vet. If your pet will be transported in an airplane then most probably you’ll need a health certificate from the vet. This may take some time to issue. Buy suitable sedatives and learn what dosage to give to your pet during the relocation process – this will make the transportation much less stressful for the pet. Get recommendations for a vet in your new location and make an appointment – the condition of your pet might worsen after you move so it will need proper treatment upon arrival. Pets can only travel either with you in your vehicle or carried as a cargo in an airplane. Cats and small dogs will easily be transported in the cabin of your vehicle while larger pets require cargo transportation in special carriers (crates). Ask what the maximum allowed size for the carrier is so that your pet can turn freely and feel comfortable. Obtain the appropriate size crate and accommodate your pet to it prior to moving. Shipping containers can be obtained from the airlines’ freight departments or purchased at many pet shops. Take the container home, put some food in it and get your pet accustomed to it. Some pets sense that changes are happening and getting them used to the shipping container will make moving smoother and easier. Make the reservation with the airline for your pet and ask what their specific regulations for carrying pets are. Ask whether your pet may travel accompanied or unaccompanied, ask what transportation charges and pet insurance are, even ask whether you can watch your pet being loaded and unloaded into the cargo hold. Of course, dogs and cats are not the only pets who are relocating with their owners. Many families move with their favorite fishes, birds, iguana, snake or other exotic pet. Moving exotics require careful research and special handling. Once on the move check periodically (where possible) shipping crate’s temperature and assure it is properly ventilated. Dogs might get nervous during travelling – they lie to mark new territories so this is one of the reasons for their nervousness, don’t be surprised. If you want to exercise your cat or dog, never do it on the loose in a new territory, always use a leash. If you need to stop and leave your pet in the car during your move, especially on a hot day, do it under a shade and leave windows open an inch or two for cross ventilation. If the day is really hot, do not leave pet in the car at all since the heat quickly becomes excessive in a parked vehicle and animals can suffer from heat prostration. Upon arrival to your new home, always enter first and check that the house is suitable for your pet. Inspect for anything that might be dangerous for the pet, such as wet paint, sawdust, broken glass or bare wires. Do the same with the yard and the surroundings – assure that the fence is secure and all doors are closed so that the pet would not escape. Also look around and assure that there are no harmful items or chemicals scattered. Do not change your routine, do as you would normally in your old home so that your pet can get quickly and easily accustomed to your new home. Moving with your pets is a responsible task – you are dealing with living creatures that can get emotionally stressed and physically hurt during transportation and can hardly communicate their concerns. Hopefully, when moving time comes, the above information will help you plan and accomplish your relocation with pets more pleasant and comfortable for both sides. Brian Jamesson is in chargewith the marketing at Xpress Movers. A dedicated moving professional and an author of moving related tips and articles.